I hope you have all recovered from the shock of the earthquake of yesterday. Our condolences and sympathies goes to the victims and affected families. It gives me great honor to attend the first Boao Forum for Asia Manila Conference. First of all, on behalf of the Chinese Embassy, I would like to extend our warm congratulations to the opening of the conference and sincere welcome to all the distinguished guests who are present here today. The Boao Forum for Asia is one of the most renowned high-level dialogue platforms for Asia and the world at large. 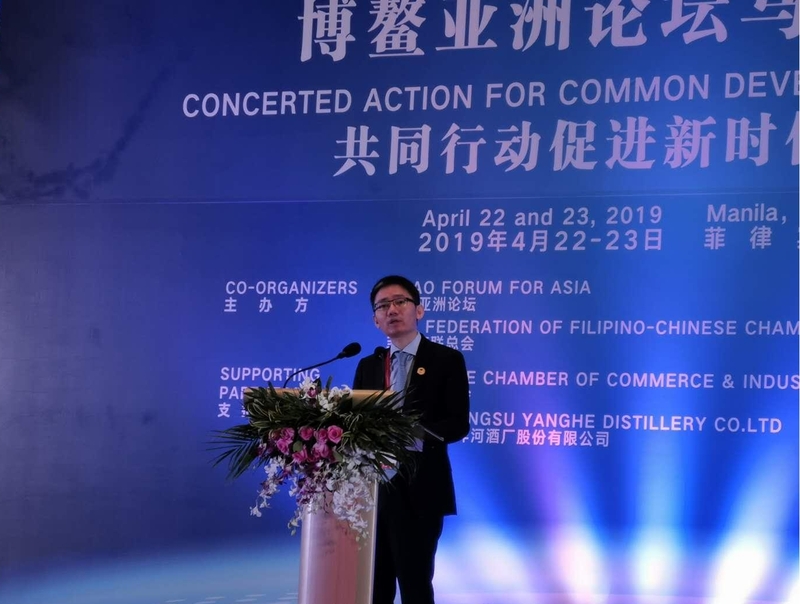 Since its inception in 2001, the Forum has dedicated itself to meaningful discussions on the most pressing issues in the region and beyond and has put forth valuable "Boao Proposals". I am very happy to see that for this year, the Forum has selected the Philippines, one of the countries which have pioneered this very idea of the Boao Forum. Today's conference, with the theme of "Concerted Actions for Common Development in the New Era", provides us a very good opportunity to share our views on how to achieve the goal of common development in the new era. Asia has been an engine house in ensuring global economic recovery and development in the past several decades. Asia now contributes more than 60 percent of the annual global economic growth. 21 of the world's 30 largest cities are in Asia. And Asia is widely expected to be home to half of the world's middle-class population very soon. However, it cannot be ignored that we are also facing a lot of challenges. Most Asian countries are still developing countries, and we have a larger impoverished population than other regions. The infrastructure of our region is still lagging far behind. The surging trends of anti-globalization, protectionism and unilateralism are threatening the region's integration and development as well. It is high time that we, as Asian countries, must demonstrate our determination and work together to achieve common prosperity for all. This year marks the 70th founding anniversary of the People's Republic of China. Over the past seven decades, China has made tremendous achievement in economic and social development. Since its reform and opening-up four decades ago, China has maintained an average annual growth rate of 9.5%. Today, China's GDP stands at $12 trillion, increasing 33.5 times in real terms and accounting for 15% of the world's total. It is the world's second largest economy with the biggest foreign exchange reserves. In 40 years, China has lifted more than 700 million people out of poverty, contributing to more than 70% to the world's total poverty reduction. The whole world is asking the same question, why China? There are numerous explanations and theories. However, in my personal opinion, two factors are very important. The first one is that China is committed to peace and stability. A peaceful and stable environment is the precondition for economic and social development. Research has shown that in the past four decades, China has never waged any war against any other country, we have never toppled any government or bombarded any other country. On the contrary, the other big power has engaged in at least 19 military campaigns and spent hundreds of billions of dollars on warfare. Secondly, China is committed to common development. Development can never be achieved through unilateralism and isolation. It is not and will never be an option for China. In the early stages of China's development, China has benefited greatly from opening its economy for foreign technology, investment and trade. As our economic strength grows, we are also ready to make our contribution to the integration and development of the region. In 2013, Chinese President Xi Jinping proposed the Belt and Road Initiative (BRI), which has become one of the most important regional platforms for cooperation. So far, a total of 126 countries and 29 international organizations have signed BRI cooperation documents with China. In the past six years, the total trade volume between China and countries participating in the BRI has exceeded 6 trillion dollars, and China's investment has grown to over 80 billion dollars and around 300,000 jobs have been created in the countries involved. The latest studies by the World Bank and other international institutions suggest that, the BRI cooperation will cut the costs of global trade by 1.1 to 2.2 percent and contribute at least 0.1 percent of global growth in 2019. It is also worth mentioning that the second Belt and Road Forum for International Cooperation will commence in two days in Beijing. Around 40 heads of states and of governments and representative from 150 countries around the world will join the forum. The Forum is bound to inject new impetus to the common development of our region and the world at large. The Philippines is one of the most important developing countries in Asia, and a natural partner in jointly building the BRI. Under the strategic guidance of our two leaders, China-Philippines relations have entered a golden age with political and security coordination, economic cooperation, and people-to-people exchanges, the three major pillars of our bilateral relations have been greatly strengthened. Last November, Chinese President Xi Jinping successfully paid his first state visit to the Philippines and elevated our relationship into one that is of comprehensive strategic cooperation. The two leaders witnessed the exchange of 29 documents covering functional cooperation in various fields, including the MOU on Belt and Road initiative cooperation. In a few days, President Duterte will lead a high-level delegation to attend the Second Belt and Road Forum for International Cooperation and hold bilateral meetings with Chinese leaders. We have every reason to believe that this visit will not only strengthen the synergies between the Belt and Road initiative and the Build, Build, Build program, but also upgrade our bilateral cooperation to a new high. The development of bilateral relations has brought tangible economic benefits to our peoples. Bilateral trade volume in 2018 reached US$55.7 billion, with an 8.5 percent year-on-year increase. China is now the Philippines' top trading partner, the largest source of imports and the fourth largest export market. We have imported more than US$ 2 billion tropical fruits from the Philippines over the past two years. Last year, we have imported more than one million metric tons of bananas and become the number one market for Philippine bananas, claiming the spot that Japan had held for over 30 years. Funded by China's grants or soft loans, a number of major infrastructure projects are continuously making headway. Among others, the two drug-rehab centers in Mindanao have been completed and turned over to the Philippine side ahead of schedule, which provided about 800 job opportunities for locals and will cater at least 300 patients. We are also building 13 schools in Davao city. The two bridges over the Pasig River in Manila are under construction and will greatly ease traffic jams in that area. The Chico River Pump Irrigation Project is expected to deliver water to 8700 hectares of rice lands and benefit 4250 farmers of 22 barangays. Once completed, the New Centennial Water Source-Kaliwa Dam could provide at least 600 million liters of water per day for the Metro Manila which could meet its water demand in the next 10 years. The Philippine National Railway's South Long Haul will largely improve transportation infrastructure which will span more than 10 cities and towns connecting Manila to South Luzon and will greatly reduce travel time between Manila and Legazpi. People-to-people exchanges have been continuously thriving. Last year, there were 1.2 million Chinese tourists visiting the Philippines. With a 29.6 percent yearly increase, China is now the second largest tourist origin of the Philippines. Every week nowadays, more than 300 flights are shuttling between the cities of our two countries. We are expecting more than 1.5 million Chinese tourists to the Philippines this year, which will create more than 32 billion pesos of revenue for the local economy. We are also implementing the MOU for Filipino teachers of the English language to work in China this coming September. One thing I would like to emphasize here is that China has no hidden agenda or strings attached to the cooperation and support for the Philippines. The so-called "China debt trap" accusation is completely groundless. According to the statistics disclosed by the central bank of the Philippines, loans from China only accounts for merely 0.65 percent of the country's total debt. Even if the planned financing is implemented, the figure will only be around 4.5 percent by 2022. If we compare the interest rates in US dollar terms, the interest rate of Chinese loans is actually very similar or even lower than that of other countries. Aside from that, China-Philippines economic cooperation will definitely create more job opportunities for Filipinos. It's more cost effective for Chinese companies to hire local workers than Chinese workers. According to latest statistics, about 50 large-scale Chinese companies based in the Philippines have employed more than 16 thousand Filipinos so far, and the number is expected to increase in the coming years. As an ancient Chinese poem goes, "The river is wide at full tide; a strong wind sends the sail surging forward." China-Philippines relations have embarked on an upward trajectory and are facing major opportunities for growth. Let us join hands and make concerted efforts to forge an ever brighter New Golden Age for our bilateral ties. To conclude, I wish the Boao Forum for Asia Manila Conference a complete success.